Here at Chiarillo's we are the masters when it comes to boilers. Whether it's a new installation, a replacement or a repair, we offer effective solutions for your heating needs. No matter if is oil, gas, propane, steam or hot water, the best heating solution is what we love to provide for our customers. We install only the best products in your home. Our certified installers partner with leading manufacturers and their quality products to incorporate them into our home heating solutions. We have installed many hydronic boilers which provide both heat and hot water to homes. Our leading partners for oil and gas hydronic boilers are Buderas and Peerless. We also partner with Navien for high efficiency gas boilers. We also offer a complete line of steam boiler solutions. Our consultants will discuss with you the advantages and disadvantages of different types of boilers to ensure that we provide the most efficient and cost effective home heating solution for you. 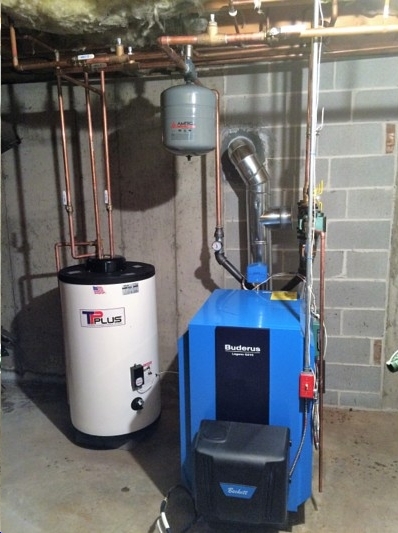 View photos of some of our boiler installations below.